To form the orders history report for a given period of time, select the “Orders History Report” function in the “View” tab of the terminal. 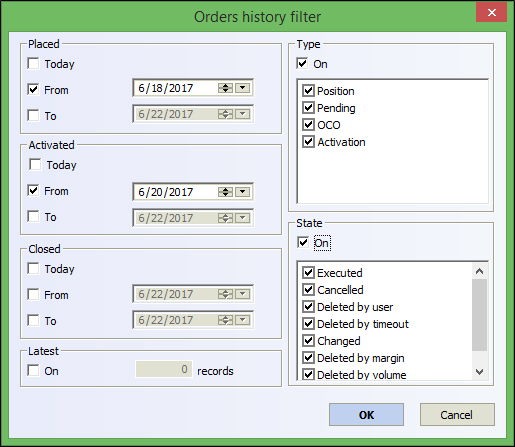 The “Orders history filter” dialogue window will open. 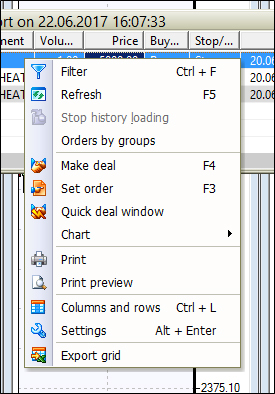 In this window, you can set date ranges for the formation of a table of operations with orders for the specified time ranges: in the section “Placed” – for orders set in the specified range; in the section “Activated” – for orders activated in the specified range; in the section “Closed”- for orders cancelled or executed in the specified range. Additionally, the table can be filtered by selecting an order type in the section “Type” and an operation type with an order in the section “State”. In the section “Latest”, you can also indicate the maximum number of the most recent displayed records. It should be noted that set orders, which have a pending status, are not displayed in the report - only actions with orders are included in the report. 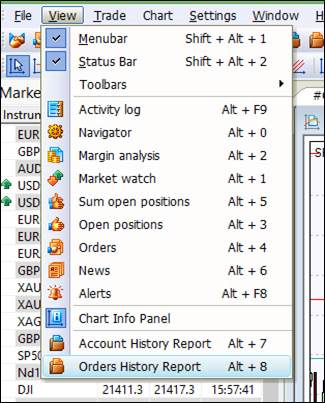 Orders that are in a pending status can be viewed in the table "Orders" of the trading terminal. Next, this report table can be sorted by any column clicking on the name of that very column. Exporting the report to a file with ".csv" extension.